Sri Lanka’s rehabilitated reputation as a sunny holiday isle continues to strengthen with all eyes peeled on the new tourist developments at Kuchchaveli, Passikudah and Kalpitiya in the north and east of the island. For now, though, the southern coastline stretching from the old fort of Galle to the wild beauty of Tangalle and Bentota remain firm favourites. 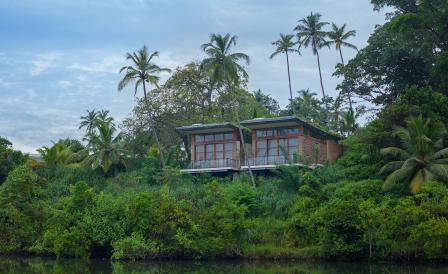 Tri has just opened on the edge of the scenic Lake Koggala, a leisurely half hour drive from Galle. With just 11 suites – three of which sit in a 40m high water tower that’s set on a hillock – a treetop yoga platform and a 21-metre cantilevered pool, the green resort offers wild tropical nature, tranquillity and seclusion in spades. Somewhat unusually, Raefer Wallis of Sri Lanka and Shanghai-based A00 Architecture, has laid out the resort in a whorl that spirals the suites from the water’s edge upwards to the water tower.